Nevertheless. Shawcross's The Interpretation of Movement (a 9:8 in blue) – the 2017 iteration of the Royal Academy’s annual Terrace Wires commission for St Pancras train station – may not be didactically or openly political in its outlook, but it undoubtedly gains in resonance from the political context in which it finds itself. Perhaps inadvertently, Shawcross has created a fine reflection on the political flux of Brexit Britain. The Interpretation of Movement (Conrad toyed with, but ultimately rejected, The Freedom of Movement as a title), is a set of three mechanical oars that rotate about a central orbit point from a position high above the Eurostar platforms at St Pancras International. The arms open and contract, passing a series of blue mesh sheets over one another to form ripples of colour that, from afar, look like spasmodic distortions of the blue girders that make up the station’s single-span ceiling. 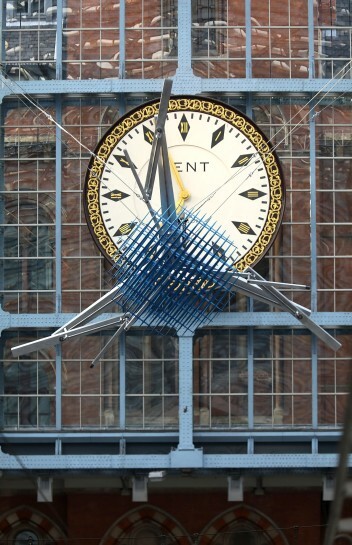 Image: Image: Conrad Shawcross, The Interpretation of Movement (a 9:8 in blue), 2017, Terrace Wires commission for St Pancras International. Photo: Tim Whitby/Getty Images for HS1.